A group of my friends are former docents for the Chicago Architecture Foundation. 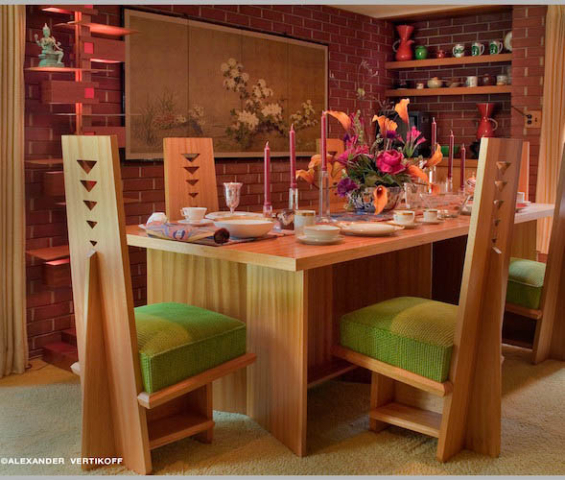 We all went through the CAF’s rigorous docent training together, studied and cooked together, and have gone on architectural adventures to many locations to see famous buildings, with an emphasis on Frank Lloyd Wright. 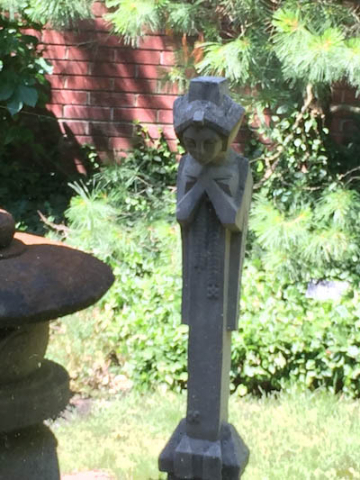 Besides the Oak Park and River Forest locations, we’ve been to Hyde Park, Beverly and Riverside to see the Robie House and other Wright homes. We’ve flown to Pittsburgh to see the magnificent Fallingwater in nearby Mill Run, Pennsylvania. We’ve driven to Columbus, Indiana, to see the superb collection of buildings by famous architects in that small gem of a city. We’ve been to Racine, Wisconsin, several times to see Wright’s Johnson Wax headquarters and the house named Wingspread. We’ve been to Springfield to see the Dana-Thomas house. 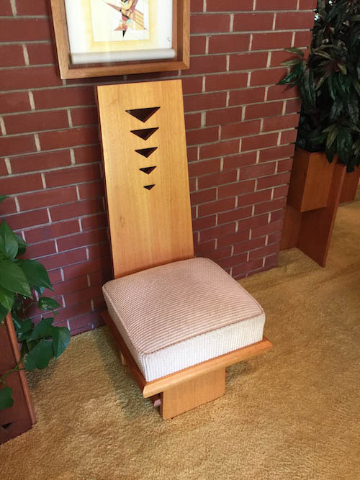 We’ve seen Wright’s Beth Sholom synagogue in Elkins Park, near Philadelphia. 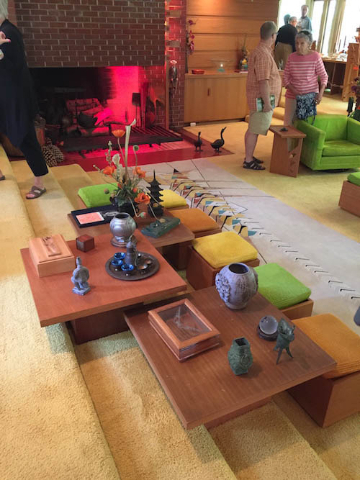 This hot summer weekend was another Wright adventure: a two-plus hour drive to West Lafayette, Indiana, to see a small, perfectly finished and preserved Wright home that was lived in by its original owner for almost 60 years, until his recent death. Samara house was named by Wright when he was working with his owner/clients, John and Catherine Christian. The Christian house is about 2200 square feet (with three bedrooms and two baths) and sits on an acre of rustically landscaped property. The Christians worked very closely with Wright in designing and furnishing the house and they and their heirs have been meticulous in maintaining the Wright legacy in design and furnishings. 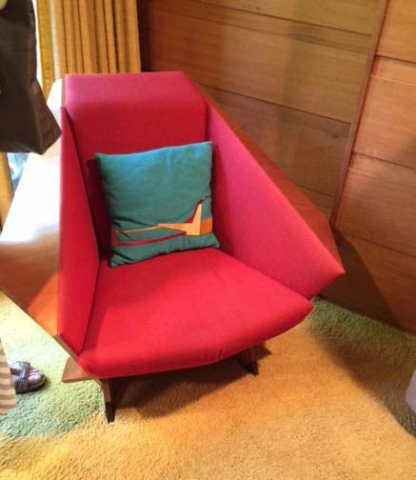 The house is furnished with mostly Wright-designed furniture, built by local artisans. 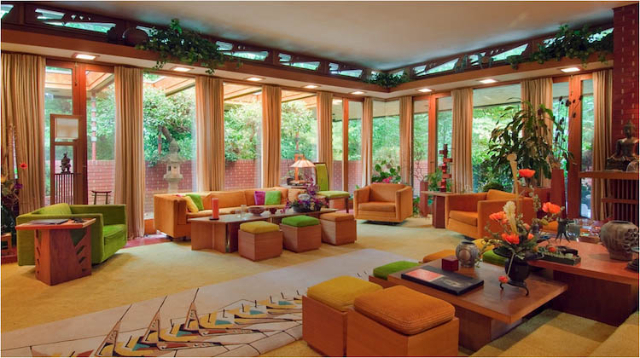 Samara means “winged seed,” and Wright used that motif throughout the house in structure, furnishings and ornament, including table and bed runners and the living room carpet. Our tour group met in the lounge or living room of the house for a briefing and discussion by associate curator Linda Eales, a knowledgeable and engaging tour leader. She began by asking the 25-plus visitors where we were from and how many Wright houses we had visited. It turned out that we were with a group of Wright aficionados, many of whom had traveled great distances to see Samara. Tours of Samara house are available by reservation April 1 through late November. The tours last about two hours and cost $10 per person. The house is located at 1301 W. Woodland Ave., West Lafayette, a few miles from U.S. 65. To make a tour reservation, call 765-409-5522 or email info AT samara-house DOT org. Slideshow photos by Nancy Bishop unless otherwise noted. Posted courtesy of Third Coast Review.